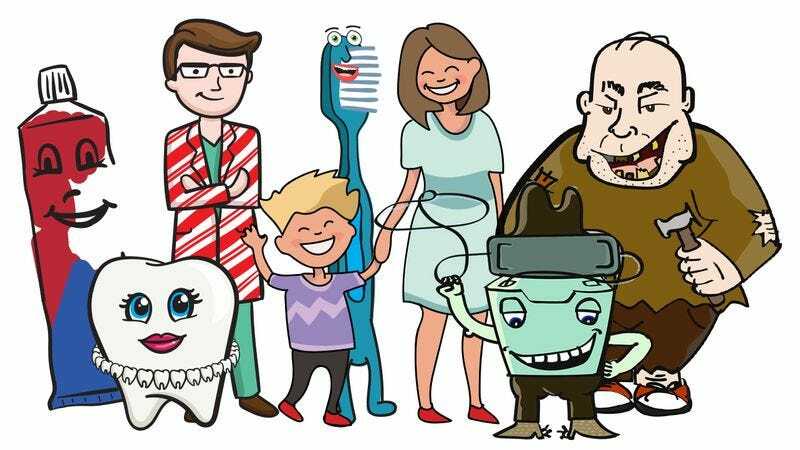 With my son, Nathan, getting old enough to brush his own teeth, I thought I’d mix a little fun into parenting and draw up some colorful cartoon characters to help teach him proper oral hygiene. Please believe me when I say that had I known they would come to life and show up at our home, I would not have created them. Hoss Floss was the first character I sketched, a chummy cowboy floss dispenser twirling a lasso. Nathan’s in a big cowboy phase, so I thought this character would make flossing more exciting. The morning Hoss Floss showed up, I’d gone out early to grab the paper and discovered him sprawled out face-up on our front lawn, mumbling his own name as he ran his nail-less fingers over his thick, waxy lasso. He was probably 5 feet tall and 3 feet wide, with a deeply unsettling girth. When I saw him, I immediately began retching. The body knows when it has seen something it shouldn’t. I must have panicked—how could I possibly explain him to my son?—because before I knew what I was doing, I’d herded him stumbling into our pool house. On paper, Wiggly is a toothbrush who just loves to wiggle back and forth so his bristles get toothpaste in all the nooks and crannies. The Wiggly that staggered out of the woods and onto my lawn that same morning was 7 feet tall with unsettlingly hairlike bristles, spastically jabbing its body skyward and shouting “Twice daily! Twice daily!” I begged it to quiet down, but it was too late; Nathan was wide awake now and pressed to his bedroom window. He watched with a panicked expression as I prodded Wiggly to the pool house with a rake. When I came inside to calm Nathan down, there was Pearl the Healthy Tooth in my own goddamn kitchen, knocking jars off the counter as she clawed at the pearly tooth necklace I’d sketched her wearing. A tooth wearing a tooth necklace seemed cute in concept, but in person it was absolutely chilling. From the stairs, Nathan howled over Pearl’s moans: “Is that in my mouth, Mom? !” he cried. “Is that in my mouth?” I couldn’t answer. I couldn’t even speak. As her feeble little legs continually collapsed under the weight of her body, I could only watch. I didn’t want Nathan to feel nervous around dentists, so I decided to draw a friendly candy-themed version of one to ease his fear surrounding checkups. No one would mistake the thing that crawled dripping up our basement stairs for human, but Dr. Sweetheart is the only character that doesn’t dredge up a wave of revulsion in me from some deep, primal place. Even though his peppermint coat was more of a moist, malformed exoskeleton than clothing, the simple, single-line smile I had given him rendered him mute, which made him more palatable than the others. He even had a calming presence on Pearl the Healthy Tooth, who stopped thrashing once she’d accepted his slick, rubbery hand into her mouth. As I led him to the pool house with Pearl in tow, I sensed he understood me in some naïve way. It made what came later that much harder. Cavity Jack was stillborn, I guess. He was floating on his back in the pool, something pale and sickly oozing from his cavities. Every now and then, a little spasm traveled through his limp body and sent out ripples. Nathan followed me out onto the patio, and over the muffled shouts from the pool house, he asked me if this is just what life would be like from now on. No boy should ever have to see something like this. I’d drawn me and Nathan into my cartoon world so he could imagine us interacting with the characters I’d created. Given what happened, that was an incredibly unfortunate decision. When the crude simulacra of my son and I came lurching out of the bushes, grinning without emotion, clasped hands permanently fused into a single doughy node, horror smothered me; it reached inside me and snapped something. Nathan pleaded with me to make them leave. I picked up a gardening spade, stepped around behind it, and drove it into one of its heads. There was no skull to crack. It was like cutting into a squash. There was no blood, but they fell, and they didn’t get up. I used the drawings as kindling to set the pool house on fire. The bodies of Cavity Jack and Me and Nathan went up easily, and it didn’t take long before the squat little structure was ablaze. The characters inside didn’t scream or cry. Wiggly just shouted “Twice daily! Twice daily!” until he stopped, or the crackling became too loud to hear him. And when I turned away from the bonfire, I saw, out on the lawn, the toothpaste character I never finished drawing, spinning slowly, drifting this way and that, murmuring. Some of him just didn’t exist; staring at him eluded me, like trying to keep track of a falling raindrop. It’s beautiful in its way. As the pool house burned and burned, Nathan and I watched him spin.